The ISP division of Fusion Network Services Corporation, FUSION GOL, (HO: Chiyoda-ku, Tokyo; CEO: Hiromi Imakoga) released the beta version of StartForce today as part of its partnership with StartForce, Inc (HO: California, U.S.A, CEO C. Jin Koh). 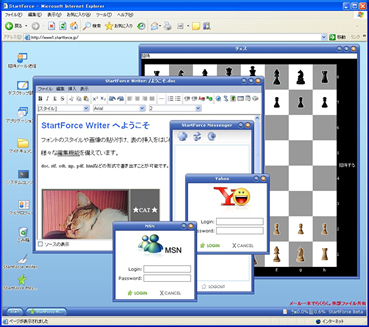 Using Ajax technology, StartForce can be called a "desktop on the web". It first appeared in May 2006 in alpha form as a new Web 2.0 solution. By combining applications running within StartForce and various file-sharing functions, StartForce creates a working environment on the web. An API was released in August, and platform development is being conducted to improve the operating environment and work environment for users. Fusion is also seeking applications which use StartForce as a platform. The beta version released today has the following features: 1) Improved server and network environment; 2) Improved platform features; 3) StartForce Writer, a word processing application that is compatible with .DOC files; 4) StartForce Messenger, an integrated messenger application. The task bar can be set to the top or bottom of the screen. Stored files can be converted to DOC, RTF, PDF, ODT, TXT, or ZIP format. Redesigned log-in screen and additional desktop themes. In addition to general text editing functions, StartForce Writer has the ability to convert DOC, RTF, ODT, and TXT files into HTML. Converts files into PDF format while downloading. Uses existing accounts and contact lists on the aforementioned services of to chat within a single application. Chat histories are saved in MyDocuments.